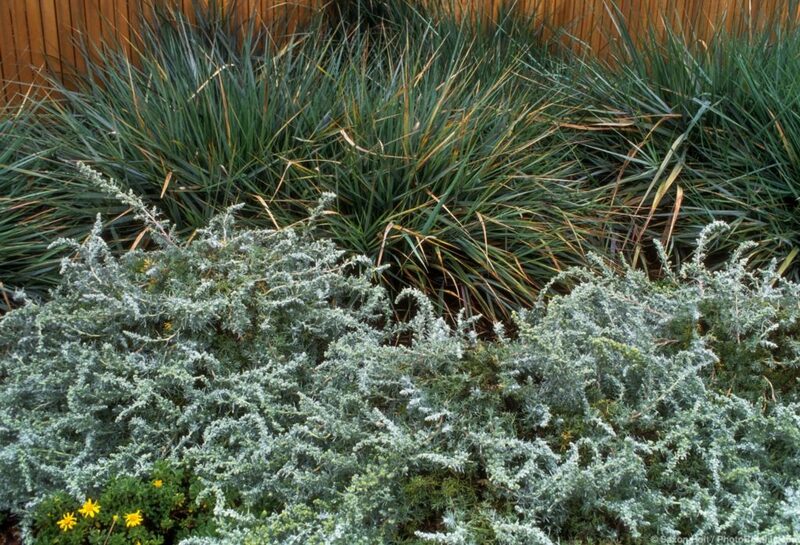 Deer grass (Muhlenbergia rigens) is a fine-textured bunchgrass with erect to gracefully arching grayish green leaves to three feet tall and four feet wide and a haze of tawny or silvery gray mid-summer flowers on stems that rise two feet above the foliage. Native to many plant communities throughout much of California south and east to New Mexico, Texas, and Mexico, this adaptable grass prefers some moisture but can go all summer without irrigation if winter rains have been sufficient. Occasional summer water may keep plants nearly evergreen. Easy and fast-growing in full sun or filtered shade, deer grass reaches its full size in a season or two and can go years without shearing, though it can be cut back in late fall or tidied up occasionally by raking out dead leaves and stems. Untrimmed, it becomes an attractive mix of tan, gray-green, and bright green as new leaves emerge and old leaves go over. Attractive as an accent or in mass plantings, deer grass is also good for erosion control, as its roots spread widely and thickly within the top twelve or so inches of soil. 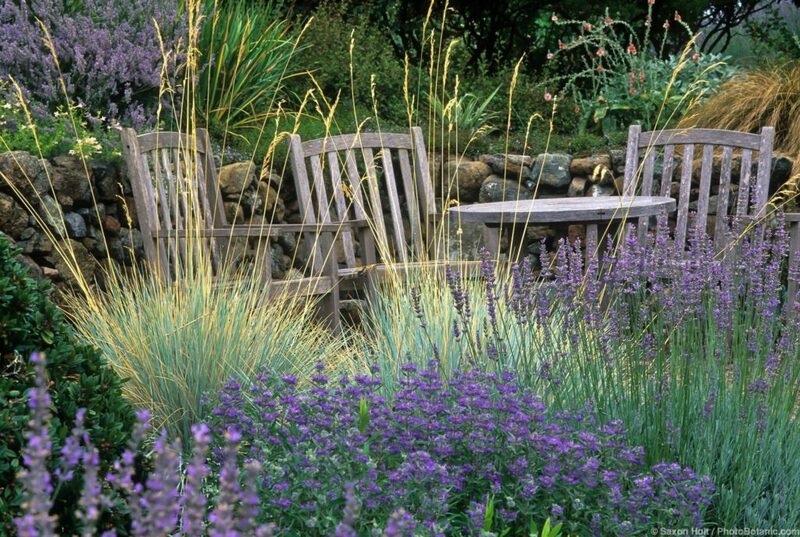 Tolerant of seasonal flooding as well as drought, it is a fine choice for a dry stream bed or a rain garden that retains stormwater just long enough for it to seep into the ground. Space plants at least four feet apart to allow each enough room to show off its symmetrically mounding form. A good habitat plant, deer grass is a winter host for some butterfly larvae and its seeds are favored by many songbirds. This is a wonderful grass if you have the space for it and don’t need to try to contain it. Left to its own devices, Leymus condensatus ‘Canyon Prince’ billows around in a large meadow planting, giving the impression of movement without the slightest breeze. It also makes an effective bank cover, its extensive root system grabbing and tightly holding the soil and its leaves cascading like falling water. It is especially nice as a background or complement to other plants. Coming out bright green in spring, this warm-season grass turns a lovely gray-green as the season progresses, ending in a striking late-summer display of wheat-colored seedheads on tall stalks. It’s only fair to warn those considering this plant that it is decisively invasive. Infiltration is initially slow, so you may not notice it for some time. But ultimately this grass will try to take over adjacent plantings, and chopping out advancing pieces may slow but not stop the invasion. I cut this grass a few inches above the ground in late winter or early spring every year, in part because this provides an opportunity to pull out invasive weeds hiding beneath the grass. This also allows me to see and remove dead culms that impede the growth of new stems, ensuring that both the plant and the colony retain their dense and appealingly architectural form. New growth begins to return almost immediately after cutting back. ‘Canyon Prince’ grows two to three feet tall with flower stalks another foot or so above the leaves. Spread is indeterminate, with gradual widening to cover extensive areas if not continuously restrained. It is best planted where spread need not be controlled, and is striking in a large container along with orange or purple-flowered companions spilling over the sides. I first saw it, many years ago, in a pot with epilobium and was instantly smitten. Plant this grass in full sun almost everywhere but in desert or hot interior locations, where it will appreciate either part shade or water. In sun near the coast it is best with little to no summer water, which will only encourage its rampant spread. Grown well, blue oat grass (Helictotrichon sempervirens) is big on drama, its narrow, blue-green leaves forming a perfectly rounded dome when not crowded by other plants and older leaves providing a subtle infusion of tawny gold. In early summer flowerheads arise on tall stalks two feet above the foliage, turning a matching golden color in late summer or fall. 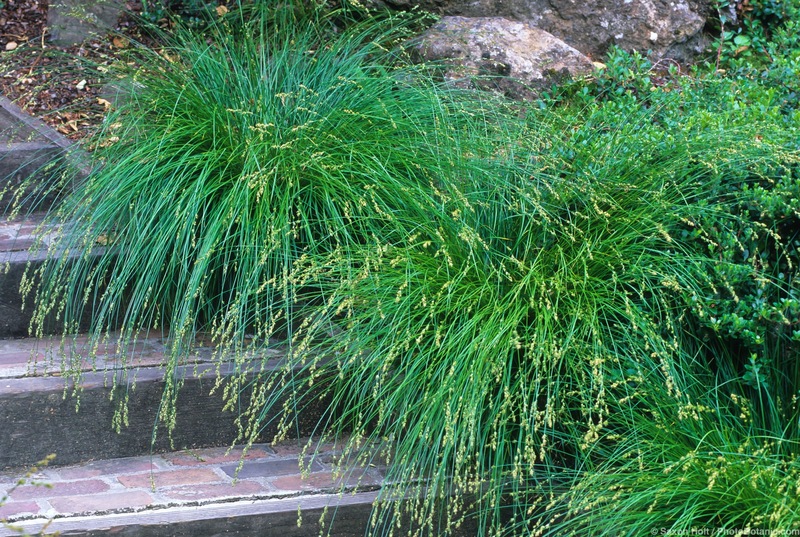 A clump-forming ornamental bunchgrass, up to two feet tall and three feet wide at maturity, blue oat grass likes full sun near the coast, but seems to prefer part shade or afternoon shade inland. This grass must have good to excellent drainage, good air circulation, and not too much water in summer. Even in winter, heavy rainfall may result in root rot if the plant is not kept free of excess dead leaves and other debris around the base. This is a grass I do not cut back in fall or in spring, in large part because it looks good year round with a little maintenance. This cool-season grass is evergreen to semi-evergreen where winters are mild. 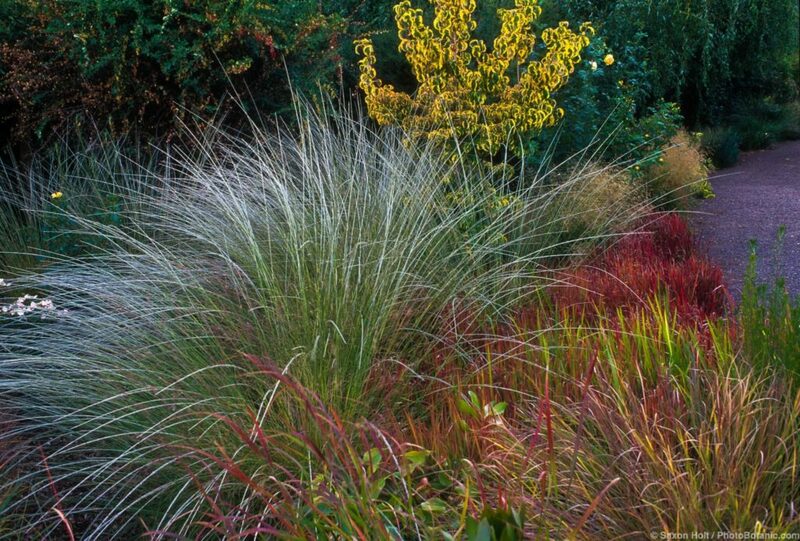 It would, unnecessarily, look quite sad if cut back the two-thirds recommended for cool-season grasses in colder climates. Warm-season grasses (e.g., Leymus condensatus, Bouteloua gracilis), on the other hand, can be cut almost to the ground in early spring, look acceptable in butchered dormancy, and come back quickly in mid- to late spring or early summer. In lieu of cutting back blue oat grass, I rake out old leaves with a steel rake two or three times a year. This is a good reason for spacing these plants at least three feet apart (another reason is that wide spacing displays the full glory of their shape and size). I lay a tarp around the plant to catch most of the old leaves that are raked out, but even then some of the very fine leaves are scattered about the garden. It’s a messy job, but easy to do, and the plant will thank you for it. 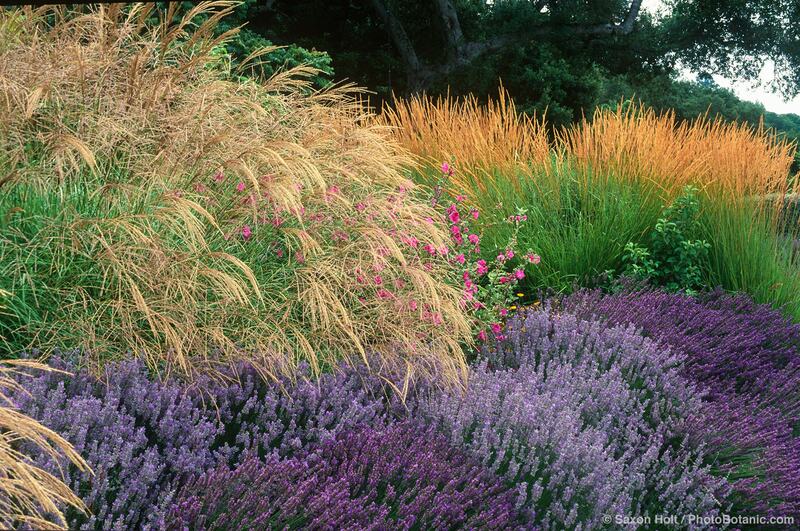 It’s important to know whether the grass you have is a cool-season or warm-season plant. Trimming cool-season grasses too harshly at any time of year may harm them irreparably. Cool-season grasses such as blue oat grass perform best where summers are not too hot and winters are not too cold. If you garden in a hot southern or inland climate, afternoon shade is pretty much required. Helictotrichon sempervirens is native to southwestern Europe, but thrives in any similar summer-dry climate if its simple needs are met. Like many tough-leaved grasses, it seems to be reliably unpalatable to deer. It is oddly disconcerting when a singular plant, long believed to be a California native, turns out to hail from some other part of the world. One such plant is Berkeley sedge. This bright green grasslike plant was formerly known and grown as Carex tumulicola, a sedge native to California and other parts of the Pacific Coast. The cover of the book was cropped from this wonderful photo from Matanzas Creek Winery. The billowing grass is Calamagrostis acutiflora ‘Karl Foerster’.